Orioles are a beautifully orange variety of blackbirds, and while they enjoy snacking on insects, they can't get enough of fruity treats--particularly oranges and grape jelly! Instead of leaving them messily strewn about your yard, try this charming feeder. It includes a dishwasher-safe plastic dish that holds several ounces of grape jelly, plus a sturdy peg for fresh orange slices. The roof will keep these treats dry, and will also shelter the birds enjoying them. 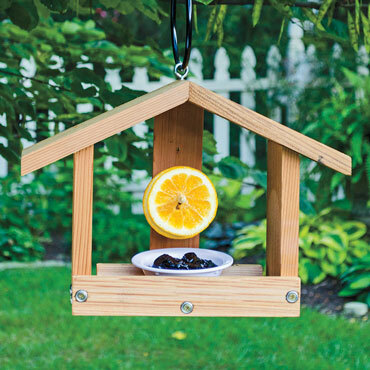 The durable cedar body contains an eye hook for mounting to a post, shed, or tree. The box measures 10.25" high, 14.25" wide, and 5.25" deep.